The Florence Studios has closed in Italy - Figurines are only be available on secondary market and we currently have none left in stock. 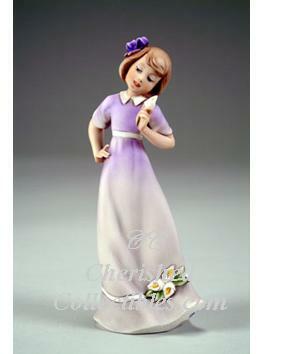 WERE AN AUTHORIZED DEALER of Giuseppe Armani Figurines. For more than 20 years Armani created masterpieces ranging from traditional Capodimonte style to more daring, contemporary, sometimes whimsical sculptures. Always, Giuseppe Armani figurines have been infused with breathtaking realism -- with a spark of life. This continues to amaze even his many admirers the world over. Giuseppe Armani describes his credo this way: "Although I consider myself a direct descendant of the Renaissance heritage, I believe that an artist has to follow his own evolution and not solely be a ruminant of the past, as glorious as it may have been. An artist conducts a search that may lead him far out in exploring new areas of interest. I continually search to discover new and better means of expression." Giuseppe Armani passed away suddenly on Saturday, October 28, 2006 of a massive stroke. There were three things in life that Giuseppe loved: his Family, Music and Art. Giuseppe Armani shared his love of art with us and created art for everyone. The magnificent creations of Armani's imagination live after him in the gallery of Art and Sculpture he left us. His legacy will endure and all of his admirers will sincerely miss his masterful Works of Art.